Cathedral Square is a vibrant urban neighbourhood in the centre of Perth. 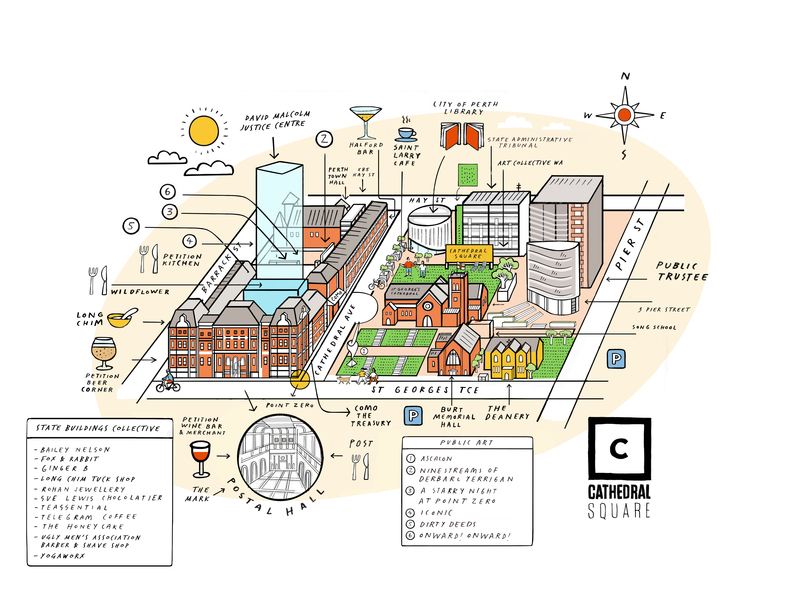 Designed as an open, interactive meeting place and public square, the precinct introduces locals and tourists to arts and entertainment experiences, retail and dining. The precinct is bound by St Georges Terrace, Barrack Street, Hay Street and Pier Street in one of Perth’s major CBD blocks. 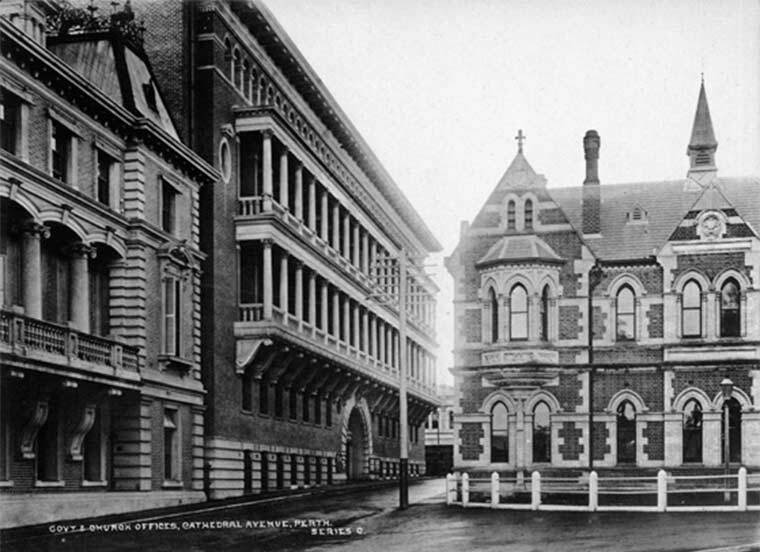 The site encompasses the historic State Buildings, Perth Town Hall, St George’s Cathedral, The Deanery, the State Administrative Tribunal building, the new City of Perth Library and the David Malcolm Justice Centre. Carefully curated retail stores, bar and restaurant offerings, a unique mix of venue spaces for hire and a public art program are complemented by an annual program of events spanning arts, culture and entertainment, making Cathedral Square a thriving, engaging urban destination. The heritage-listed site, which comprises the former government buildings known locally as the State Buildings, has returned the soul of the city to its people after decades of disuse. Most recently state government offices, the three interconnected State Buildings have housed the Treasury, Premier’s office, the Lands Titles building, Perth’s Post Office and more over their 140-year history. In 1925, the south-east corner of the complex was marked the city’s ‘point zero’ – the geographical marker at which all distances to Perth are measured. 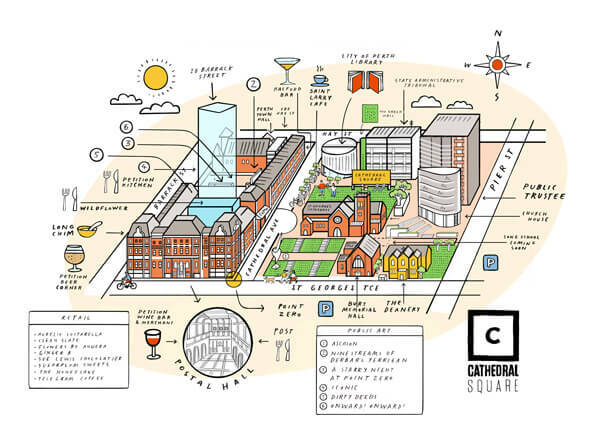 The revitalisation of Cathedral Square will see the city’s energy centre once again around its historic heart, with that marker now at the threshold of the lively Cathedral Square retail and dining precinct. Perth’s burgeoning local economy calls for a more sophisticated hub to serve the needs of both residents and visitors, and the new precinct will anchor a vibrant, cosmopolitan centre for culture, art, community and style. The refurbished buildings work together, not in isolation – the precinct’s restoration sees the demolition of the old Law Chambers and Playhouse Theatre to open the eastern side of St George’s Cathedral for the first time in decades. In their place stands an open, interactive public plaza between the Cathedral, the State Buildings and the newly built City of Perth Library, for the enjoyment of all visitors. Artfully combining tradition and modernity, the city’s historic neighbourhood has been returned to the people of Perth. Many people have collaborated to realise Cathedral Square’s ambitious vision. Parties including FJM Property, the City of Perth, Mirvac, the State Government, the Public Trustee and the Perth Anglican Diocese have worked together to create and maintain the precinct. Explore one of Perth’s most significant historic sites with a self-guided heritage tour. Download the PDF booklet here. Cathedral Square is specifically designed so that our services, information and facilities are accessible to all. Accessibility features include ramped pathways, lifts, handrails at stairs, accessible toilet facilities, ACROD parking bays and accessible wayfinding and signage. For specific venue access and restrictions, please contact directly and a member of the team will be happy to help and advise.